Multifunction Control Handle has ergonomically positioned dual thumb wheels with twist grips, lift, lower and horn buttons for simplified operation of all controls with either hand. Multifunction control handle is designed for multi-tasking operations while either walking or riding. Steel reinforced control handle is impact-resistant and easy to service by simply removing four screw. 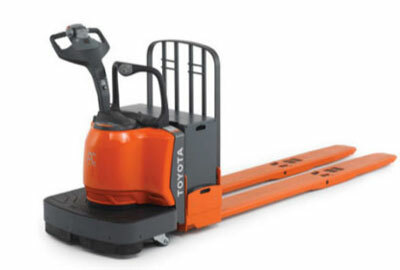 Double and triple-length pallet fork trucks contain increased structural load support on the fork tips to accommodate tip-loading applications.